Many algorithms can be implemented most efficiently with imperative data structures that support destructive update. 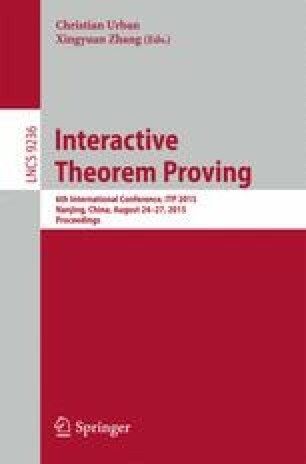 In this paper we present an approach to automatically generate verified imperative implementations from abstract specifications in Isabelle/HOL. It is based on the Isabelle Refinement Framework, for which a lot of abstract algorithms are already formalized. Based on Imperative/HOL, which allows to generate verified imperative code, we develop a separation logic framework with automation to make it conveniently usable. On top of this, we develop an imperative collection framework, which provides standard implementations for sets and maps like hash tables and array lists. Finally, we define a refinement calculus to refine abstract (functional) algorithms to imperative ones. Moreover, we have implemented a tool to automate the refinement process, replacing abstract data types by efficient imperative implementations from our collection framework. As a case study, we apply our tool to automatically generate verified imperative implementations of nested depth-first search and Dijkstra’s shortest paths algorithm, which are considerably faster than the corresponding functional implementations. The nested DFS implementation is almost as fast as a C++ implementation of the same algorithm. We thank Rene Meis for formalizing the basics of separation logic for Imperative/HOL. Moreover we thank Thomas Tuerk for interesting discussions about automation of separation logic.